This journey began almost 15 years ago. While taking classes at seminary and trying to grow in my understanding of my faith, my beloved wife Janie shared with me some videos by Ray VanderLaan. As I watched the very first faith lesson about Tel Gezer, dots were connected that were never connected before (at least at the seminaries I attended). The heart of God was clearer to me than ever. Practical observations and plausible explanations of the Middle Eastern culture of the Bible made the Text come alive. I discovered answers to questions that had rattled in my mind for years which I never thought I would find. I had a place to begin the discussions and the process. The bible went from being something I read by faith, skipping the portions that made no sense to me, to a book I wanted to read and understand as best as I can. This led to my first trip to Israel in 2005. There I met Rami Fellemon, our gracious tour guide who helped me understand the people of the land. We have been friends since. A graduate of Jerusalem University College and a PhD candidate, he is extremely well educated. He has a passion for people. He also has a desire to help people to understand the Bible. Especially those of the land of Israel who might have cultural or religious barriers to understand the heart of God and what He did through Jesus. He took over the leadership of Jerusalem Evangelism Outreach which his uncle started. (Learn more about JEO: www.jeoministry.org). By God’s amazing provision in 2007, I had the privilege to meeting Ray VanderLaan and spending time walking in his footsteps through Israel. Within me, a fire was lit to begin to help others understand God’s story in His land as well as disciple people. Through my position with Athletes In Action, I was able to do just that, leading discipleship tours for the past nine years. Over that time, my family and I have been on a journey together spending extended lengths of time living in Israel serving and studying at Jerusalem University College. What makes Walk the Story unique? We desire for you to experience the people of the land as well as the land itself. JEO is able to provide opportunities to engage Jews and Palestinians in meaningful ways, through meals in people’s homes, deep conversations and opportunities to serve in the community. You will leave your time in Israel with experiences most never have when they come. We also desire a relationship with you. While in the land we want to create an intimate group able to comfortably process what you are learning together while in Israel and when you return home. We also like to make ourselves available to assist you as you begin to unpack your spiritual souvenirs through the materials for past tour participants only. Lastly, what makes Walk the Story unique is that all the proceeds go to support the people of JEO and other ministries. It is a win-win in every way. 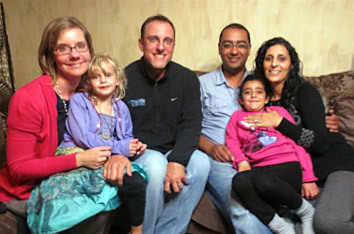 You will return home forever changed because of your investment of time in Israel.